This post AND that tattoo are brilliant. Love it! Such a clever, unique idea for a tattoo. And I eagerly await the tattoo removing mall carts. Assuming they're located next to the liquor mall carts. 'Cause that would make it an official mall party. Thanks so much for the shout out Kenny! It means a ton!! Just found your site and love it. GREAT tattoo! I got my first (and only) tattoo when I was 25 (3 years ago). It was my birthday resolution to finally get it. I'm off to read more of your posts. Thanks! 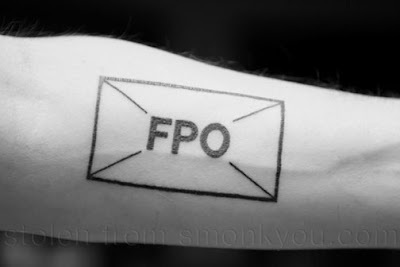 I have a similar tattoo that I got without seeing yours (mine is a square FPO and it's just a box with an X, no text). I had never heard of it referred to as an FPO, just as a placeholder, so thanks.